John Kokoska and Steve Angers, both of Red Brook Fame, have started a new restoration effort in the Wesptport River Watershed. The Westport River Watershed encompasses the towns of Westport, Dartmouth, Fall River, and in Rhode Island, Tiverton and Little Compton. We meet on the first Saturday of the month at the Brookside Conservation area off of Route 177 in Westport. This gives TU the access to Bread & Cheese Brook. B&C will be the initial restoration focus as there are 2 breached dams that need to be removed. All funds donated will be used for this effort. If you live on the South Coast and are looking for a dynamic project to join the Westport River Watershed will be the place to donate your time, effort, and money. The Southeastern Massachusetts Chapter of TU has received $20,000 from the Massachusetts Environmental Trust for the restoration of Red Brook where it flows through 70 acres of cranberry bogs in the stream’s headwaters. 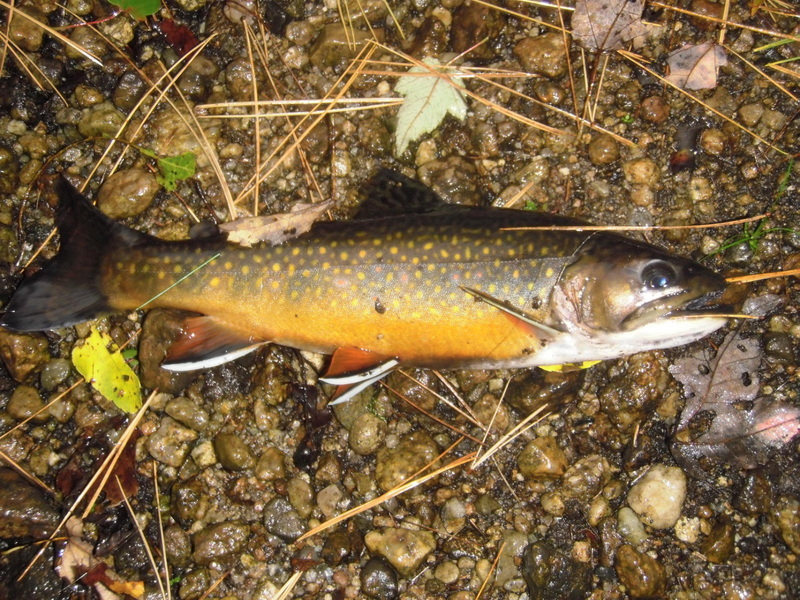 Red Brook is a sea-run brook trout stream that empties into the northern end of Buzzards Bay near the west end of the Cape Cod Canal. Trout Unlimited volunteers have been working to restore Red Brook and its salter brook trout population since the early 1990s. To date, TU and a long list of partners that includes The Trustees of Reservations, the Massachusetts Division of Fisheries and Wildlife, the Massachusetts Division of Ecological Restoration, and the A. D. Makepeace Company have removed four dams, restored riparian wetlands and placed hundreds of logs and root wads into Red Brook to restore the stream’s habitat diversity. The stage was set for the final phase of Red Brook’s restoration when, in 2009, the Massachusetts Division of Fisheries and Wildlife purchased 245 acres from the cranberry growers A.D. Makepeace Company to complete the protection of Red Brook along its entire 4.5 mile corridor. Under a lease agreement with the Division of Fisheries and Wildlife, A. D. Makepeace will complete their last cranberry harvest from the 70 acres of bogs that Red Brook flows through in the autumn of 2014. After more than 100 years of cranberry culture, the bog complex, appropriately named Century Bog, will be decommissioned, Red Brook’s channel where it flows through the bogs will be naturalized, and the bogs will be restored, as nearly as possible, to the complex wetlands that they once were. The flash flooding and thermal impact caused by the periodic flooding of the bogs and subsequent releases of solar heated water into Red Brook will come to an end. The funds that the Southeastern Mass. Chapter has received from the Mass. Environmental Trust (MET) will be spent on the final design and permitting of the project. Some of the funds will also go toward a study of macro-invertebrates in Red Brook to help shed light on the impacts of pesticide use by run of river cranberry operations. While it is anticipated that Red Brook’s macro-invertebrates will respond to the decommissioning of the bogs, a base line is needed to establish the extent of macro-invertebrate recovery over time. A pictorial history of Red Brook will also be partially funded by the MET grant. The Massachusetts Environmental Trust is funded by the sale of license plates to state residents wishing to support the restoration and protection of the Massachusetts environment. This is the second grant that MET has awarded to the Southeastern Massachusetts Chapter of TU.